Happy National Chocolate Cake Day. I love this holiday. Okay, I actually didn’t know it was a real holiday until after I baked the cake. But, I say, go make one yourself. Put your feet up and eat cake. I made this cake for my daughter’s birthday party. 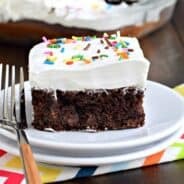 I love the richness of the chocolate cake with the deep chocolate flavor of the buttercream frosting. Man, I wish I had some left. I guess since it’s National Chocolate Cake Day I should go bake another one. Right? In a bowl, mix flour, cocoa, salt, baking soda and baking powder. Set aside. In a measuring cup, mix together cooled coffee and milk. Set aside. In mixer, beat butter and sugar for 5 minutes, until smooth. Beat in eggs one at a time. Slowly add in dry ingredients alternating with the coffee/milk mixture (about 3 additions of each). Pour cake batter into two prepared pans (2-9inch round cake pans, lined with parchment paper and greased and floured). Bake in a 350 degree oven for about 25 minutes. Remove and allow to cool about 10 minutes before removing from pans. Cool completely before frosting. For the Frosting: In mixing bowl, beat butter, powdered sugar, cocoa, extract and heavy cream for several minutes until desired consistency. both things: the cake AND the buttercream….fabulous. I need this, asap. Chocolate cake and chocolate frosting…no I don’t need a holiday for this beauty…I need some in my life today!!!! You had me at chocolate! This looks fabulous! Chocolate and coffee and almond? Hello!! Oh I don’t think there are two better combinations. Thanks for putting your heart into the holiday inadvertently. Wow that is SOME cake! Chocolate overload 🙂 Looks fantastic. 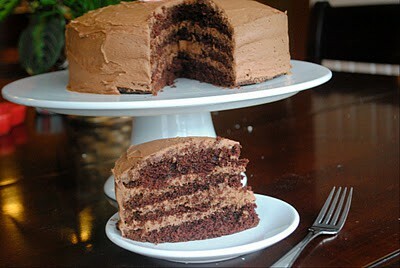 Oh how I love chocolate buttercream! We are on the same page today. LOVE chocolate cake with chocolate frosting. Youtsnlooks beautiful! 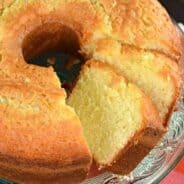 Oh this cake looks amazing! Can’t go wrong with chocolate and chocolate, yum! What a great looking chocolate, CHOCOLATE cake! I need a huge slice!! How did I miss this holiday1 Chocolate cake with chocolate frosting is my favorite, I need to get a calendar of these events! I love chocolate cake… LOVE… looks delish! 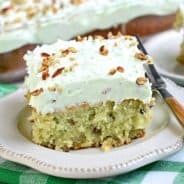 Fabulous and delicious looking cake! A classic that will never ever get old. I am happy to hear that there is a National Chocolate Cake day! It is deserving of the recognition. Your cake is gorgeous.